Of the thousands of images he took this year in places like New York, Berlin, Dresden, Moscow, Marrakesh, Detroit and Miami, photographer Jaime Rojo found that the image still stands prominently in the Street Art scene - along with text-based, abstract and animal world themes. Surprisingly the scene does not appear to be addressing the troubled and contentious matters of the political and social realms in a large way, but the D.I.Y. scene keeps alive and defies the forces of homogeneity with one-of-a-kind small wheat-pastes, stencils, sculptures, and aerosol sprayed pieces alongside the enormous and detailed paintings that take days to complete. Every Sunday on BrooklynStreetArt.com, we present "Images Of The Week", our regular interview with the street. Primarily New York based, BSA interviewed, shot, and displayed images from Street Artists from more than 100 cities over the last year, making the site a truly global resource for artists, fans, collectors, gallerists, museums, curators, academics, and others in the creative ecosystem. We are proud of the help we have given and thankful to the community for what you give back to us and we hope you enjoy this collection - some of the best from 2016. 1Up, Above, Adele Renault, Alaniz, Amy Smalls, George Vidas, GEN2, Apexer, BordaloII, Buff Monster, C215, Collin Van Der Sluijs, Super A, David Choe, D*Face, Duke Riley, El Sol 25, Sean 9 Lugo, EQC, Faile, Faith47, Faust, Shantell Martin, Felipe Pantone, Hueman, Droid907, Icy & Sot, InDecline, Invader, JJ Veronis, Jilly Ballistic, John Ahearn, JR, London Kaye, Louis Masai, MadC, Marshal Arts, Mongolz, MSK, Rime, Myth, Nina Chanel, Optic Ninja, Otto Osch Schade, Panmela Castro, Plastic Jesus, QRST, Reed b More, Remi Rough, REVS, Self Made, Sharon Dela Cruz, Maripussy, Specter, Stikman, Strok, Swoon, Ted Pim, Thievin' Stephen, Farin Purth, Thomas Allen, Tobo, Uriginal, Vermibus, Vhils, Wing, Yes Two, Zola. 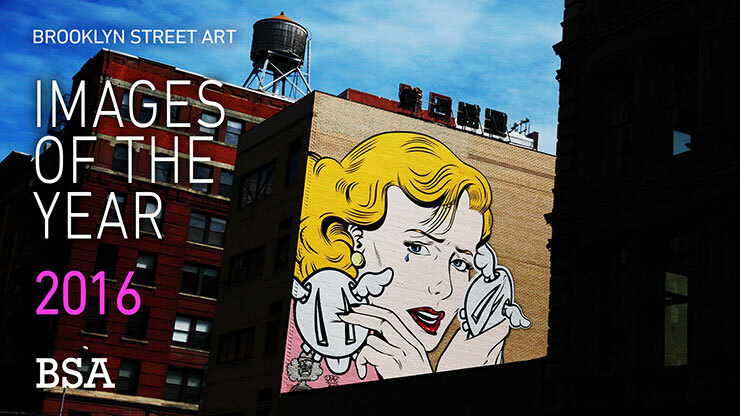 The artist featured on the main graphic is D*Face as shot by Jaime Rojo in New York. Please note: All content including images and text are © BrooklynStreetArt.com, unless otherwise noted. We like sharing BSA content for non-commercial purposes as long as you credit the photographer(s) and BSA, include a link to the original article URL and do not remove the photographer's name from the .jpg file. Otherwise, please refrain from re-posting. Thanks! Read all posts by Steven P. Harrington and Jaime Rojo on The Huffington Post HERE.